When I was a child, Dad’s advice used to be: make sure you have someone in the photograph; otherwise you might as well buy a postcard. His advice rested on the idea, perhaps, that each photo of a sight was interchangeable. In the age of the internet, it seems advice which needs updating. But perhaps he was right – what does my photograph of the Eiffel Tower mean to people who are not me? Everyone knows what it looks like. For people who are interested in me, seeing me in the frame adds something to it; Dad’s advice holds up. And then perhaps if it’s artful or striking or unusual in some way it might be worth looking at on its own terms. On the other hand, perhaps photos are not for others at all. Perhaps they are for the self – a record of where one has been, what one has seen. A prompt for memory, or probably more likely, they become a substitute for the memory itself. Or not quite either of these ways of saying it – perhaps we can say the photo becomes canonical for how the moment is remembered. Our neighbour enthusiastically told me about his strategy for overseas holidays: the first day, take the bus tour past all the major sights and photograph everything. That way, you’ve caught all the important things, even if you don’t get time to go back to them all. There is to this a wonderful logic of photography as acquisition, or perhaps photography as trophy-gathering. The photograph not so much as a record of experiences, but as proof of experiences – there is a difference. This morning I found myself photographing the four lone graves in the churchyard without reading them, without really seeing them beyond acknowledging them as picturesque. Photomania had grasped me! I’d substituted it for experience! Yet despite my critique of the flashes and clicks on the tourist circuit, I have an opposing impulse, a contradictory anecdote. On the Gen Y bus carrier, being made to feel rather old, I found myself censuring the young Australian backpackers for their failure to take photos. To be fair to me, it was more their failure to appreciate the sights in general, rather than their specific failure to take photographs. The bus was coming through the Swiss Alps on a beautiful autumn afternoon, but almost all of them were staring with a kind of bored detachment at a TV show. Appropriately, the show was An Idiot Abroad, the gist of which is the audience laughing at a British bogan’s failure to appreciate other cultures. It was a surreal moment; at one stage he was even on a tour bus, and the backpackers were on a tour bus surrounded by Switzerland as they watched someone else on a tour bus. You should be, I told them in my head, appreciating this scenery, capturing it, if not with a camera then with your eyes. Because this is the essence of tourism! But this leads me to other thoughts, on the varieties of consumption which different demographics understand as “tourism”, and how I’m caught between them. I intend to write on this next. What is it that I am saying, then, in the end, about photography? I’m saying I’m ambivalent. I’m saying it’s good in small to medium doses, but perhaps it can distort the way we “do” tourism. And I say all these things as one unsure what I want from photographs – what I want to photograph, and what I want to do with it once I have. I have left most of it on this present holiday to my wife, who is a far better photographer than me. The few I’ve taken with my cheap camera show a sort of wilful idiosyncrasy. 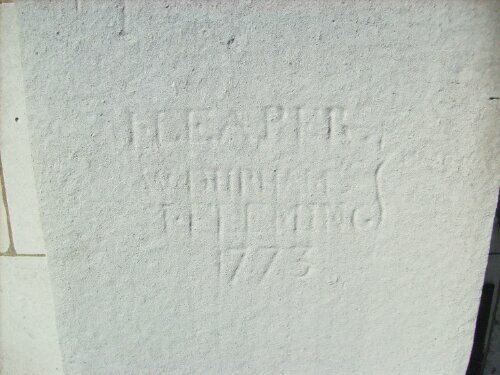 A piece of graffiti carved into the wall of St Paul’s dating from the 18th century. A stone watering trough with the year “1913” chiselled into it. Some pigeons resting on a stubborn patch of weeds growing on a narrow ledge of a stone bridge. Such is the sad consequence of one who overthinks photographý and tourism.